NASA is always looking for new scientific advancements that will keep astronauts safe during their space exploration and experimentation. Space conquest and medicine are interrelated, and either field can advance the other. Telemedicine and other medical tools help NASA ensure the well-being of its astronauts and put all luck on their side. Six decades of space exploration have enabled major advances in health and medicine. Directly or indirectly, the transfer of space technologies paved the way, for example, for Magnetic resonance imaging (MRI), CAT Scans, voice-controlled wheelchairs, LVADs (Left Ventricular Assist Device), light-emitting diodes (LED) for tumor treatment, and many other medical innovations. In parallel, space missions require top notch medical assistance, to ensure that the astronauts can work safely and efficiently. Constraints linked to the near-vacuum space environment make it very challenging, both technically and financially, to urgently repatriate astronauts back to Earth. It’s equally unfathomable that, whenever a health problem arises, to quickly send a doctor to the ISS. In the future, specialized physicians likely won’t be able to travel to the Moon, Mars or even farther. As a combination of information technologies allowing fast data transfer and space technologies, telemedicine allows the ground teams to assist ISS crews. NASA developed a model based on three principles; medical training of crews, use of ultrasound, and a medical link with the ground via telemedicine. Telemedicine has been spun-off for use here on Earth because it can be as useful and practical for the ISS as it can be for remote locations on the planet. Astronauts operate in an isolated environment in the ISS–much like some populations on Earth. For both, access to the traditional form of medical care is difficult if not impossible. The human body is designed to live on Earth. Long space missions are a great challenge for astronauts. 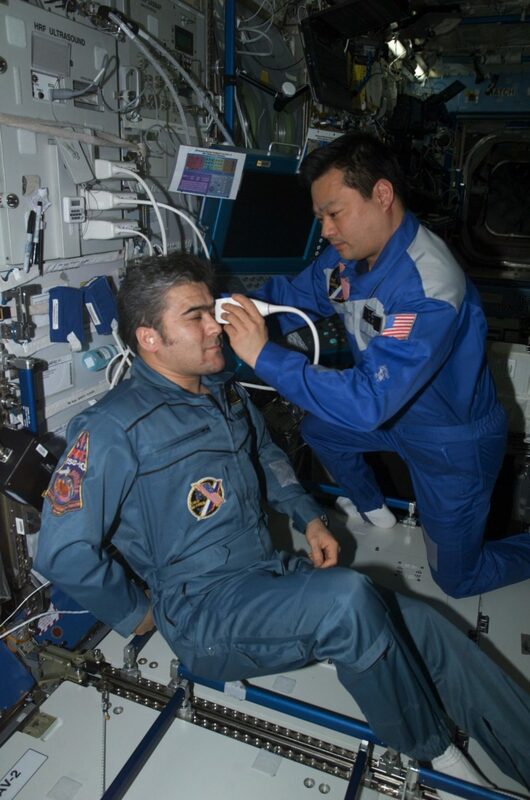 The medical follow-up performed on the ISS crews show the effects of microgravity on the human body, such as the deterioration of the bones and musculature, and ocular degeneration problems. NASA–mainly via HH&P (Human Health and Performance)–is developing new ways to protect astronauts during long space flights. But, in addition to in-house solutions, NASA can benefit from Industry 4.0 tech solutions that happen to have a space health application. On that note, researchers at the Australian National University (ANU) have created a nanomaterial that can be adjusted by temperature to make it reflect or transmit light on demand. The novel nanomaterial can, for instance, turn a mirror into a window, and this feature alone could be adapted to provide astronauts with extra protection against harmful radiation. What other tech can you think of that would help keep astronauts safe?